Maxine Jimenez brings a spirit of community activism to UC Santa Cruz. 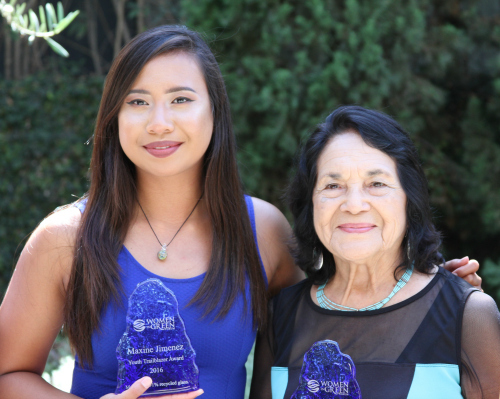 Maxine Jimenez, left, with American labor leader and civil right activist, Dolores Huerta, who was also honored by the Women In Green Forum. Maxine Jimenez (Kresge ’19, politics and community studies) is on a bold mission: to educate and empower youth to become agents of change in their community. At only 19, Jimenez’s efforts are already being recognized: She is the 2016 recipient of the prestigious Women in Green Forum Youth Trailblazer Award. Every year, the Women In Green Forum Steering Committee recognizes a young environmental leader who is making an impact in the areas of climate change, sustainable development, and human rights. In addition to honoring Jimenez this year, labor rights leader, Dolores Huerta was also recognized. Huerta co-founded the National Farmworkers Association which later became the United Farm Workers. “To me, this award isn’t something that ‘I won’, this award is holding me accountable to continue my work to keep fighting not just for the people, but with the people,” Jimenez said. For more than half her life, Jimenez has been committed to solving environmental issues. This commitment continues at UC Santa Cruz, where she serves an academic mentor and a volunteer with the Kresge Garden Co-op. She also serves as the fiscal co-chair and carbon fund representative for the Education for Sustainable Living Program, a student-run organization that offers student-facilitated discussion and research projects for credit every spring quarter. She even helped bring co-founder of the activist group The Yes Men, Igor Vamos, to campus. There are many issues that Jimenez is troubled by—and they are all connected, she says. At the age of 8, Jimenez moved from San Pablo City in the Philippines to Highland Park in Los Angeles. “I came from a tropical forest to a parking lot,” she remembers about arriving to her new home, a low-income and marginalized neighborhood. So Jimenez organized community cleanups and tree adoptions. She lobbied for the environment at the California State Capitol. She attended a Climate Reality Leadership Training led by Al Gore with the Alliance for Climate Education. She started a plot in a community garden that she donated to Franklin High School. She also created the School Alliance Committee, a group that aims to connect high schoolers with the local neighborhood council and surrounding community. But Jimenez feels that is not enough. She wants to see more youth actively engaged in community issues that affect them. “Youth voices are not in political spaces,” she says, adding that young people have the potential to be a mobilizing force. Next summer, she’ll organize a youth leadership institute for sophomores and juniors at her former high school. She hopes to bring together local community activist groups with students to open a dialogue for community change. In the meantime, Jimenez is busy as a residential assistant in Kresge College, where she involves her residents in programs and campus life. “This award is a reminder that as young leader, I need to remember that it isn't about what I have obtained, but about what I have done for others to obtain greater./"